Rockingham Music Academy offers affordable music lessons in every style and genre. We are unique in our ability to pair students with teachers that encourage the highest level of development and musicianship. We offer lessons for a variety of instruments and abilities, in a fun and safe environment. All of our lessons are one-on-one with qualified instructors at our council approved educational establishment. This allows a customized curriculum to suit the goals and interests of the individual while developing a foundation of theory and technique. and have the highest quality Music Instructors in the area. Music is an activity that engages all areas of the mind and has been proven to boost brain development in young children. It provides benefits for people of all ages because it is a rewarding and social activity. Taking private music lessons from an experienced teacher is the best, most effective, way for anyone to reach his or her full playing potential and now is the perfect time to enroll!! Private lessons at just $35 for thirty minutes with our team of highly-qualified teachers. We also offer WORKSHOPS on a variety of topics, as well as periodic LIVE PERFORMANCES for our students. We can offer advice on buying or renting instruments as well, so please get in touch to see how we can help bring Music to your life. An Eight-Week Course with our Director and Head Teacher sharing their decades of experience as performing musicians throughout Australia and the United States. Covering the Topics of Building a Repertoire, Stage Presence, Equipment and Sound, Performance Etiquette, Bookings, Marketing, Branding, Promotion, Press Kits, EOIs, Networking, and Invoicing. Includes a Live Performance at our End of Year Showcase to over 200 attendees. 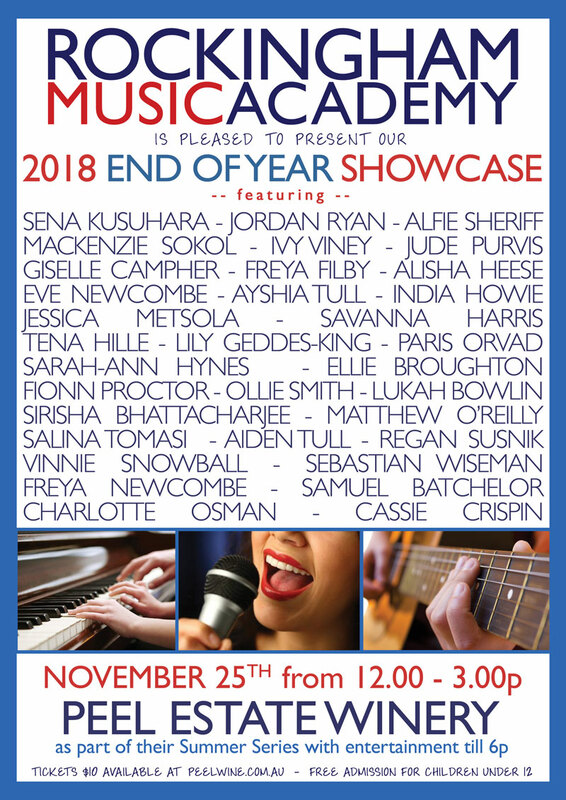 We are so proud of all our students and are excited to present our END OF YEAR SHOWCASE of selected performers on November 25th as part of the Peel Estate Winery Summer Series.
? In addition to the RMA Showcase, the event will feature performances by Natalie Carmody music, Kings and Queens and Apollo's Attic from 3.00 to 6.00p. It is a great opportunity for the students to see a variety of professional acts, so we encourage you to stay and enjoy the day. How do you know if our music lessons are the best? we know it takes more than one lesson to tell if a teacher is the right teacher for you or your child, so before committing to direct debit or a full-term booking we're offering a no obligation way for you to really give RMA a try! Discount available to first enrolment per student and total cost of four lessons must be pre-paid in order to be eligible. All lessons included with this promotion follow the terms & conditions of weekly bookings. We pride ourselves in our ability to provide high-quality music tuition and it is 100% of our focus.